Roger Schmidt is the present football sweet-heart. With his style of play, Schmidt is bringing a new passion of football play. With what he believes as the right way to play, Schmidt takes football to the next level of entertainment. To the extreme level of intensity, full of power, physical charges and speed. Roger Schmidt always wants his team to play directly (vertical moves at its finest!). It’s fast, deadly and entertaining – at maximum notch. If you are really interested in fast football style or anything that has something to do with speed, then you say England are the land where speed finds its own master, I suggest (instruct) you to take your eyes to the other land, to another country. The land of fast football and high-intensity pressing game, being the philosophy and find its true home – Germany. And, Leverkusen are the best for that. With Roger Schmidt as the director. Here I will provide you with my tactical analysis of Roger Schmidts’ Football tactics and systems used under his FC Red Bull Salzburg (2012-2014) tenure. But the current Bayer Leverkusen manager has recorded some impressive results compared to clubs with higher reputation for playing attacking football. They are currently one of the top 5 clubs in Europe with most shots per game (more than Barcelona and second most in Germany) and dribbles per game. The style of play is highly entertaining kicking off Borussia Dortmunds misery in the first league round in additional to many other great feats. Let me detail how I see Roger Schmidt plays his absolute-entertaining system below. Yap. I’m in the middle of my new motivation to continue my FM2015 Persiba save and the entertaining attacking style utilized by Schmidt the past years has taken my motivation back to enjoying Football Manager 2015, right where it’s supposed to be. This tactical analysis of Roger Schmidts playing systems will become the first part of two. The first part details how Schmidt’s Red Bull Salzburg side trashed (my immortal-love club) FC Bayern 3-0, while the second part discusses how I’m trying to implement it to Persiba Balikpapan on Football Manager 2015, an Indonesian lower league management (LLM) team! Schmidt plays with 2 basic shapes. The first one is a 4-5-1 system, while the other is more similar to a basic 4-4-2 basic shape. In fact, Schmidt tactical fluidity is far wider than what I had just mentioned. What I just said about the two, is no more than a very simple description of Roger Schmidts system of play. Before stepping into the next part, let’s go back to the past, for a while. In the era of 8-10 years ago, the 4-4-2 shape seemed to find its own end of life. The why is so simple. You can find the root cause within itself. The natural weakness of 4-4-2 is the thing to blame. This basic shape is weak at the space between the striker strata and midfielder. There are a lot of spaces opened at that area. It, in turns, isolates the striker duo and finish off the team attacking strategy. The non-existing of the number 10, being one of the main cause. The weakness on vertical space to be exploited by the opponent. Things are getting worse, when/if the opponent is playing with 4-3-3 basic shape and plot a defensive pocket (DMC) in the crucial 5 vs 14 playing zone. It (combined with two CMS) easily creates the situation of 3 v 2. The benefit, that becomes the very huge support for 4-3-3 to dismantle 4-4-2. The blue (Persiba) with 1 DMC and 2 CMs. The orange (Persija) with 2 CMs. Persiba easily win the rule of numbers, as they always create the 3 v 2 clash situation. Here is where Roger Schmidt (and Diego Simeone) come up and play 4-4-2 with different style of play. They play their 4-4-2 with an uncommon hybrid shape. The two wingers (RM-LM) asked to sit narrow (very narrow) to overload the central area and dealing with the natural weakness of 4-4-2. When the team on attack, Schmidt is widely-known as the one who loves to hit the half-space. Kevin Kampl and Sadio Mane (right and left) are the main weapon for such business. These two are known as the demon-speed, smart dribbler, good space awareness, and (of course) aggressive ones with amazing work rate. Take a look at the RM. He is standing between the central and left back. The orange circled area is the half space. You can also see the asymmetric concept to trick the opponent formation. 4-5 players on the left side and 1 player on the far right, are the players to widen the horizontal gap. As you can see in the picture, it helps creating wider half space for the RM to move into. RBS Off-possession shape. Their two wingers sit narrow and limit the passing option for Bayern. The other option taken by Schmidt, is, he drags one of his two strikers to occupy the number 10 post and transforms the shape from 4-4-2 to 4-2-3-1. This is applied when team are in off-possession situation. That’s the right situation to play this way. As the team need more players to cover the central area and defending as well. 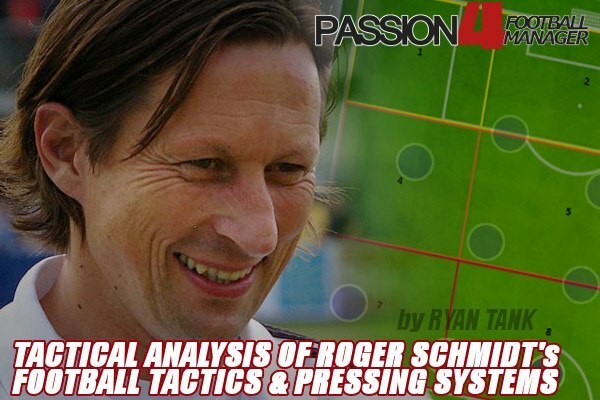 Roger Schmidt transforms the shape, when off possession, from 4-4-2 to 4-2-3-1. Roger Schmidt striker duo got slightly different task to take. In defensive phase or in its transition, one of the two, as what I had explained above, is more involved on the midfield area. Several times, in the match against FC Bayern, he swaps position with Sadio Mane (LM). On counter attack, he has to surge forward and gets into the box. With such duty, a striker with classy play making-ability, would be absolutely pushing this tactic to the maximum level. Jonathan Soriano is the other striker. He is functioned as the “stay forward striker” and got the license to stretch the opponent defensive line on his own will. He is free to dribble, lays off, or make long distance shot. He, occasionally, moves to the wide area to open the room for Kampl to move into the space. A complete forward and the leading striker. Both Ilsanker or Leitgeb, are the machine room for the midfield line. They both are tasked as the shield for the team back line. This is crucial, because, the aggressiveness of the four front liners, in Schmidt concept of play, is extremely high. On defensive phase, one of this double pivot drops deep and becomes the deepest one of all midfielders. When the team on attacking phase, they are becoming the supervisor from the outside of the box, keeping their eyes to the in-game situations changing, in case of opposing team counter attack or the need of recycle possession. When the opponent on possession and get into the RBS most advanced defensive area (7, 8, or 9 zone), these two CMs will no doubt be doing anything to stop the opponent. They are free to charging at ball or make a hard sliding tackle. Let’s look at Red Bull Salzburg’s back line. Basically, 2 RBS full backs are well-known as the modern backs who are extremely aggressive when it comes the time to attack. In certain situations, Schmidt full backs are free to roam and choose the best way to make further impact to the opponent’s defense. In pressing strategy, the full backs have some options to choose, depending on the situations. When an opponent near the touchline, they’ll press them hardly. Physical challenge can be to be applied if needed. Or, when one of the wingers is pressing the opponent ball carrier, RBS full back will stay close to give another support pressing. In the wide areas of midfield, Sadio Mane and Kevin Kampl are the main weapon. In the match against Bayern, they are given slightly different duties to do. Mane, on the left side, is the man who always tries to hit Bayern (right side) half space, by utilizing his speed and dribbling ability. Kevin Kampl is slightly different. Not always relying on his speed and dribbling skill. He is often seen moving far to the central area and occupies the central attacking midfielder position, as he also got the ability to create chance through his killer ball instinct. With his ability of passing, no wonder if Kampl being the RBS player with highest percent of completed pass. The first goal (image below) by Sadio Mane is the perfect example to see, how these two deadly weapons are working together. They create space, they create chance, they utilize their best ability, before finally slotting the first goal of the match. Kampl and Mane sits narrow and create the first goal of the match. In the match against Bayern, RBS players not always applying full court-press. Most of the time, they start the pressing from the opponent zone 7, 8, and 9. Pressing started from the 7, 8, or 9 zone. Schmidt avoids the full court press to keep the number of his players and overload them in the midfield and striker strata. Roger Schmidt pitch middle pressing. But, different action would be taken, when Bayern player is carrying the ball near the touchline area. Roger schmidt, in such condition, asks his players to press immediately. This pressing applied with 2-3 players are closing down the opponent, plus 1 player as the support pressing. On defensive phase, Schmidt has several different things to take. The first one, is, when Bayern players are approaching the 1/3 of RBS defense area and playing their possession football. In this situation, 1 player presses the ball carrier. This player is shadowing the opponent player to limit his options. The other players are controlling the space by positioning themselves at Bayern passing lines. When applying defensive pressing in deep area, Schmidt doesn’t want his boys to press the opponent too intense. He doesn’t want his players to always “charge at ball” or make hard sliding tackle. Schmidt tends to keep the shape tight and little bit carefully in organizing his shape. The below image is one example how RBS players trying to keep their shape before finally stopping Götze run with physical challenge. When the right moment comes. Götze down. On more advanced area of their own defense, RBS players will press the opponent with different level of intensity. They try to regain possession as fast as they can do. Schmidt intense pressing at pitch middle. Very close space between players. The yellow boxed area (7 to 12 zone), is the area of where Schmidt boys tend to press more intensely. That’s the crucial area for Roger Schmidt to force mistake and hit the opponent through a fast counter attack. Outside of these areas, Schmidt prefers to lose the intensity and trying to reshape or keep the shape compacted. When the opposition are at 13 to zone 18, Schmidt tends to invite them and tries to punch back from the 7 to zone 12. When the opposition are approaching the deeper area (4, 5, 6), Schmidt, firstly, prefers to lose the intensity to make sure his players are narrow enough to form a compact defensive shape. In this situation, Schmidt would be happy to push the opponent wide or, if they have to, stop the opponents attack before they get into the zone 1, 2 , 3. Roger Schmidt has been known as a manager who appreciates time more than anyone else. Right after his players stop the opponent attack and regain possession, Schmidt wants them to release fast attack. With this concept comes to mind, direct passing play, is absolutely being one of the primary option. Quick pass to the opponent opened space. Or, if they have a good aerial ability and ball-holder striker, such as Steffan Kiessling, Schmidt will no doubt set this kind of striker as one of his main target of his up front strategy. Direct the ball to the striker, hope him to hold up ball and brings others into play. The quantity of ball possession is not important. The point is the quality of possession. Schmidt wants to only play fast football in order to kill the opponent as soon as possible. That’s why Schmidt would always be topping the statistisc as the team with the most shot attempts. Half space; this is the Schmidt favourite area to exploit. The combination of off the ball, space awareness, accurate through ball and good timing decision, are crucial. The first two goals are showing this all. Look at Mane movement (the second goal) and how he utilizes the half space. And how Ilsanker decides to make firt time pass to Mane. They are the epitome of Schmidt direct football. The vertical move at its best. Roger Schmidt half space attack. Ilsanker delivers a perfect float ball to Mane, who has been waiting at the Bayern right half space. This Mane’s movement then leads to the penalty reward, after Dante forced to foul him in the box. Schmidt doesn’t always apply full court press. RBS will press Bayern high up the pitch, when 2-4 Bayern players are positioning deep, around zone 1 to 6. In this certain situation, RBS will press with (as one of their pressing shape) 3 men up front + 3 men in midfielder strata. Creating pressing trap, trying to force Bayern releasing long ball to the central area and hit them as fast as they can do. In many occasions, his players are waiting at the pitch middle (7 to 12 zone), inviting Bayern to come then press them intensely. RBS intense pressing is started here, at pitch middle. They tend to stop the opponent attack around this area. Roger Schmidt loves the vertical play. Schmidt applies this kind of play by combining the short-quick passing game, direct pass, and very fluid off the ball movements. When the team sit deep and regain possession, the deeper players (can be anyone with ball on feet, at 1 to 6 zone), find Jonathan Soriano is on the right position (10, 11, or 12 zone) they are given permission to launch a long pass directly to Soriano or the space in front of him. The full backs are licensed to attack aggressively and stretch the opponent defense through the both wide areas. They are asked to give enough cover on the wings. When Mane or Kampl is making defensive-pressing to one of the Bayern winger, the full backs are getting closer and keep the distance, or, for some certain situation, help creating double-closing down. The double pivot are responsible to guard the central midfielder area, press the opponent, being the shield for the defense line, and deliver direct pass to the 4 up front players. They’re not the central midfielder pair who are licensed to roam and drift forward to get into opponent box, nor Makelele role, that stays on defensive pocket and act exclusively as a water-carrier. Sadio Mane, as the left midfielder, is trying to attack FC Bayern (right area) half-space from time to time. This being the main option of his style of play. Kevin Kampl, the right midfielder, is slightly different. He often sits far narrow (to the central midfield area). And acts like an attacking central midfielder, who controls the play. You can name his role as winger-play maker or wide play maker. From his respective position, right and central area, he often delivers a lot of quality killer balls. On defensive phase, Mane is taking slightly higher position compared to Kampl does, as Mane, and Soriano, seem to be prepared for the counter attack strategy. The striker duo play different roles. 1 of them is asked to drop deep when defensive transition and defensive phase, moves to the midfield strata, and forms 5 midfielders shape. When counter attack, he surges forward and moves into the penalty area. The other one, is Jonathan Soriano. He is taking position on more advanced areas. Stays forward and leads the line on his own will. A complete forward and the main goal scorer as well. With such intensity of pressing and fast attack, there will be flaws to exploit. Schmidt can be trying to hit the opponent with high-speed game, but, when the opposing team are able to fail it and find their way through, then, a lot spaces opened and can be hit by great speed. Anyway, Roger Schmidt absolutely deserves immense credit for implementing such tactical vision, that not only to win the match, but, also fun and highly-entertaining to be seen. A counter-pressing of his version. That’s all, folks. See you at next part. The second part of Roger Schmidt tactical project implementation. The part where I’ll be writing about how I try to inject such intense play into my Persiba Balikpapan. Cheers.